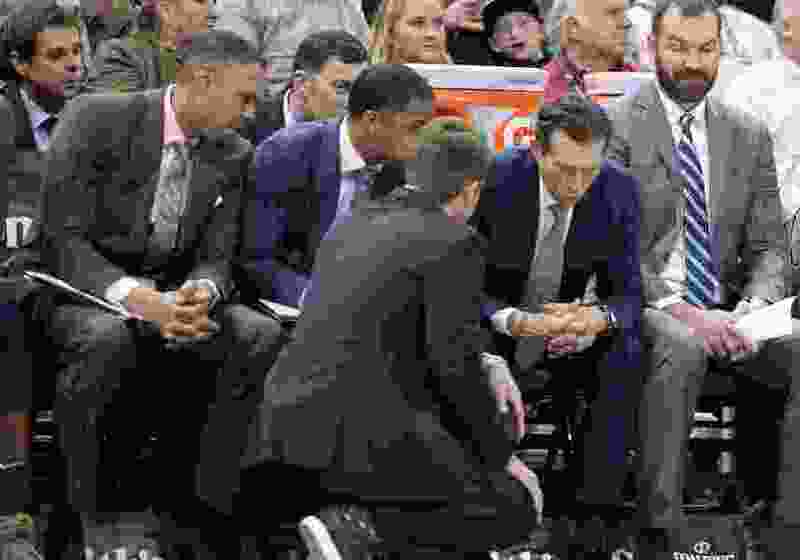 Leah Hogsten | The Salt Lake Tribune Utah Jazz coach Quin Snyder reacts to the loss with his coaching staff during the Utah Jazz loss to the Toronto Raptors, 111-124, Monday, Nov. 5, 2018 at Vivant Smart Home Arena. Three thoughts on the Jazz’s 124-111 loss to the Toronto Raptors from Salt Lake Tribune beat writer Andy Larsen. Remember how this game was a “Schedule Alert” game for the Raptors? Well, it certainly didn’t look like it. The Jazz just got absolutely blasted by a Raptors team playing on a back-to-back, without their star Kawhi Leonard. Yeah, the Jazz didn’t have Donovan Mitchell, and that would be a good excuse if they played well defensively, but not offensively. That’s not what happened. The Jazz were a trainwreck on the defensive end, especially in transition. The Raptors were supposed to be tired, and instead they just ran right past the Jazz: 20 percent of their offensive possessions were classified as transition, and they scored 183 points per 100 possessions on those plays. That wasn’t just after turnovers by the Jazz, it was after missed shots. Fully 30 percent of the time after a Jazz miss, the Raptors got out and running, and even on just those plays they scored 188 points per 100 possessions, according to Cleaning The Glass. It’s stuff like this. Ricky Rubio comes up the court and takes a shot that would be decent for many point guards (well, if his foot wasn’t on the line), but just isn’t a good look for him. He misses, and Rudy Gobert wildly goes for the rebound even though he’s 20 feet from the basket. That means when he inevitably doesn’t get the rebound, Pascal Siakam is matched up with Rubio down at the other end (maybe Ingles could have taken Siakam? ), and he quickly takes advantage of for the and-one. So it’s shot selection, it’s shot-making ability, it’s floor balance, and it’s intelligence. Give some credit to the Raptors for taking advantage of these opportunities, and they are one of the league’s best teams in transition. But the Jazz just have to be so much better. The weird thing is that the Jazz have been historically very good at transition defense in the Quin Snyder era: last year, for example, they ranked third overall, thanks to holding teams to 116 points per 100 transition possessions. Off of live rebounds, they were the league’s best defense, getting back nearly every time for a 104 defensive rating. There’s been a lot of focus on how the Jazz might be struggling with the new defensive freedom of movement emphasis, but I don’t think that’s really it: transition defense is about getting back, being in the right spots, and staying in front of your man. The Jazz just aren’t doing that as well as they did last year. The other reason that the freedom of movement thing isn’t a satisfying explanation for me: theoretically, the Jazz’s defense is less based on limiting freedom of movement than anyone. Instead, it’s about keeping players in front in pick and roll, and then relying on the longest, most fearsome shotblocker in the league to dissuade shots and force misses. Except that guy isn’t doing it at his best right now. The Jazz are still much better with Gobert on the floor, but players seem to be having a surprising amount of success against the Defensive Player of the Year. Gobert was subbed out at the next dead ball. Later on in the quarter, Gobert was subbed in, and again failed to make his usual impact. It is nice and talented of Fred Van Vleet to use his body to prevent the shot block here, but it felt like Gobert was in a bad position to begin with. Gobert is trying to prevent Serge Ibaka from getting a lob pass, but the path for Van Vleet is too easy here. Again, it’s not that Gobert’s been awful, or even below average. He’s just not playing like the best defensive player in the league right now. For what it’s worth, Gobert understands that he has to do better as the leader of the Jazz defensively. Despite all of the above problems, the most common complaint I heard about from fans about the Jazz after the game was about their free throw shooting. I don’t mean to call Howard out here, but he’s just an example. Sorry Howard! Yes, the Jazz have been bad on free throws during their four-game losing streak, shooting 61 percent over their last four games. And yes, if they had made their free-throws at a league average rate, they would have beaten Minnesota. That would have been nice! Do you know what else would have been nice? Not allowing Derrick Rose to score 50 points. Tonight, not allowing the Raptors to get out and score in transition nearly every single time would have been nice. In fact, average defensive efforts in essentially every category would have made a much bigger impact than if they had been average at the free throw line. If the Jazz would have been average from the free-throw line against the Raptors, Utah would have scored four more points, and still would have been blown out. Yes, missed free throws are annoying. But every player, and certainly Quin Snyder, should be focusing on more important things right now. Improving five percent on, say, pick and roll defense, will matter a whole lot more than improving five percent at the free-throw line, and is significantly more teachable. The free-throw shooting will come around. There’s no reason to believe that, say, Joe Ingles has just immediately become a significantly worse free-throw shooter overnight. Instead, it’s probably just a dose of randomness.